Bears are eight species of the family Ursidae, among them the largest living terrestrial carnivores. A bear is a stocky mammal, ranging in size from 59 pounds (sun bear) to well over 1,000 pounds; despite the size difference between species bears resemble each other in their physique. The eyes are small, the ears round and erect. The usually elongated snout accommodates 40 or 42 teeth depending on the type. Their body is massive and stocky, the head is large, and the limbs are rather short relative to their size, yet very strong. Males are considerably larger than females. All bears walk plantigrade, i.e., with the soles and heels fully on the ground. Each foot has five digits bearing large, non-retractile claws. The tail is short and rather stubby. Their usual moving gait is a rather slow and leisurely walk, but they can run as fast as 35 mph. The thick, shaggy fur is generally brown, black, or white, depending on species; however, color variants occur within species. The American black bear is known for having brown, tan, cinnamon, or even white variants, and the giant panda with its bold black-and-white pattern. Bears are generally loners, congregating in small groups when there is an availability of food, such as streams during salmon movements. For sleeping, they often retreat into caves, hollow tree trunks, or earthen pits. Several species keep a winter rest during the cold months. It is not true hibernation, as the heart rate and the heart rate drop significantly, but the body temperature decreases only slightly and they are relatively easy to wake up. Bears are generalists and inhabit a variety of habitats, from the Arctic polar regions to grasslands, mountainous areas, and forests varying from cold alpine to tropical rainforests. Only very dry areas such as deserts are avoided. 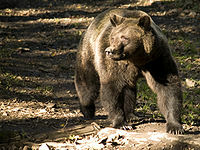 Bears are found over much of the Northern Hemisphere from Eurasia to America, with a species in South America inhabiting only its north-western part. In Western and Central Europe there are now only a few relic populations. The one African subspecies - the Atlas bear - was once found in the North African Atlas Mountains and died in the 19th century. Bears are generally omnivorous animals which, depending on the species and season, consume varying amounts of plant and animal food. Fruits and other plant parts make up a large part of the diet in many species, supplemented by insects and their larvae and small vertebrates like fish or rodents; an 800-pound grizzly bear will graze on berries with the same relish it would when eating meat. At the extreme ends of the diet scale are the giant panda, which feeds almost exclusively on bamboo, and the polar bear, which is the only dominant carnivore within this group. Every one to four years the female gives birth to offspring. Most births fall in the months November to February, when the female keeps to the winter rest. The actual gestation period is very short, usually about 60 to 70 days, and the one to four (usually two) cubs are born very small; among animals bears have one of the highest adult-to-newborn weight ratios. The mother alone takes care of the cubs, and during this time she is extremely aggressive, attacking almost every intruder on sight, including other males and humans. The weaning takes place after three to nine months, and the young bears stay with the mother for up to two years. The maturity of the males is three to six years, the maximum size of the males is often reached in only 10 to 11 years. Bears are long-lived animals, in the wild they can live 20 to 30 years, and up to 50 years in captivity. Probably due to their size and power, bears play an important role in the mythology and cults of many peoples, with numerous myths showing a worship of these animals. Heraldry also contains numerous figures of bears as armorial supporters, and they are also found in numerous fairy tales and legends of many peoples. At the same time as worshiping, the hunting of these animals took place for a variety of reasons. Various body parts are used: the meat is eaten, the bear skin is processed into clothing or blankets, and teeth and claws are used for ornamental purposes. Often, body parts of bears are given a medical effect, especially the bile used in Chinese medicine. Bears were and are also being captured for entertainment purposes. In animal fights, the animals were battled with dogs or humans in antiquity. They were entertaining as dancers and circus performers, and even today they are often held in zoos or roadside attractions, sometimes under bad conditions. Another reason for the hunting is the consideration of the bears as food competitor and potential threat to humans. Bears often tear vestibules and plunder beehives or fish ponds. However, the actual extent of these damages is often exaggerated. Bears and people tend to avoid each other on sight, with the exception of a female defending her cubs, often with fatal consequences. Although unprovoked attacks are rare, several people die each year during bear encounters. For all these reasons, including the destruction of the habitat by human settlements, many species have become rare or have completely disappeared in certain regions. Brown bears, for example, are only found in relic populations in the core area of ​​the USA and in western and central Europe; they are completely extinct in North Africa and Mexico. The Malay bear, and especially the giant panda, are among the most endangered species. This page was last modified on 24 May 2017, at 19:53.